SENSEI DRY EVOLUTION™ shear takes dry cutting to a whole new level of PRECISION. 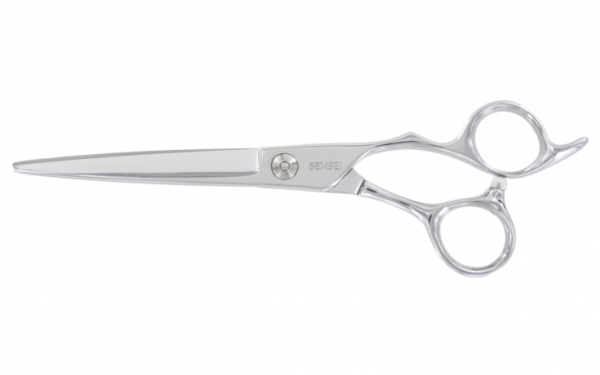 It starts with a completely new edge design that allows you a much greater ability to cut dry hair without as much movement on the blade.The new Sensei Evolution Dry Cut shear is a multi purpose shear that takes dry cutting to a new level.The Evolution will allow you to cut a straight line as well and excellent slide cutting all in one shear. It has a completely new edge design that allows you to cut dry hair with out it moving on the blade.This added precision, will speed up your work, and give you a new level of control. It is also excellent on wet hair as well. Made from Japanese Cobalt Molybdenum Alloy Steel and has been through a cryogenic tempering process adding precision and an edge that will last . The Tension system features ball bearings to stabilize the blades for longer lift, and to reduce friction and when wet cutting.The handle is sculpted to feel great in your hand. Hydrogen bonds are intact in dry hair making it 30% harder to cut which is why we have invented the PRECISION DRYCUT™ blade design.This added precision, will speed up your work and give you a new level of control. Of course it’s smooth and precise for wet hair too. Made from Japanese Cobalt/Molybdenum alloy steel with SENSEI CRYO™ Tempering the precision of this blade will last and last.